Here are some of the best antique Warner's bottles seen on the Internet. If you have a top Warner's that you would like to show off here, then please submit JPG picture and description to rlynch@antiquebottles.com. Also indicate whether you would like to publicize your name/Email as the owner of the bottle. See Antique Warner's Bottles for more info. 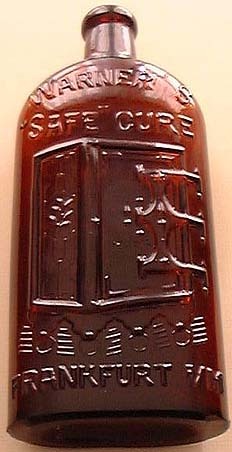 3 cities Warner's Safe Cure, large 11 1/4" size called an animal cure. H.H. Warners / Tippecanoe in dark green amber, a rare color variation since these are commonly found in amber. Pressburg is the rarest city of all the Warner's. This example in perfect conditon with strong strike was found in Bekescsaba, Hungary. Amber pint with A&DHC on base. pint size in rare aqua coloration. Article on this bottle find in the March 2001 issue of Bottles & Extras by the FOHBC. #32 in the Warner's Guide, but this example is one of a few with its original label. Sold on eBay by Chip Cable. Amber example of the Frankfurt, Germany Warner's.